During my years as a historical interpreter I have often been asked about Victorian mourning fashion, but rarely, if ever, have I heard this question from a child. So we talked about it. I told him about the Victorian-era tradition of recognizing grief through fashion. Women, especially, wore black clothing in specifically chosen fabrics that were deemed appropriate. Jewelry was limited to anything made of jet, or made out of the hair of the deceased. I explained to the boy that certain, recommended lengths of time for wearing mourning fashion were customary, depending on how close you were to the deceased. “Do you find that people avoid talking to you about your parents?” I asked. He answered without hesitation. “Yes,” he said. Again, the boy instantly replied. “Yes,” he said. The boy’s guardian, a woman of obvious character who had been with us the whole time, explained that she often takes him to their old house, and that together they look at pictures and talk about his life before his parents’ death. “It brings him so much comfort and joy,” she said. After our short but memorable exchange the boy and his guardian continued up the main street, and I sat pondering the differences between life now, and life when Barkerville was in its heyday. And I have thought a lot about that boy ever since. I wish I had been braver, I wish I had asked him more questions. I wish I had, at that moment, been more Victorian. Rather – in that moment – I had stepped out of my historical role and allowed my modern self, a self that was terrified of upsetting this young, vulnerable visitor, to step forward. In the late 19th-century, the Victorian era in which Barkerville was created and the first Cariboo Gold Rush flourished, death was definitely not the taboo subject it is to modern North Americans. The Victorians engaged in many death-related traditions that, now, we would find odd or even shocking. For example, Victorians posed and photographed the bodies of their loved ones shortly after death so as to keep a record of the deceased. The resulting photographs were often manipulated to make the bodies appear more lifelike. To our modern sensibilities this sounds terribly macabre, but the Victorians did not fear and avoid death like we do. For the most part, we live in a time when the subject of death is avoided whenever possible, or at least negotiated with awkward self-consciousness. The Victorians, who dealt much more comfortably with death, may have a lesson to teach us all. When we lose a loved one, we don’t necessarily need to wear black clothing, but I think we should understand that mourning is a necessary and crucial part of life. We are learning a kind of Victorian lesson in mourning this season in Barkerville. Tim Sutherland, our beloved Judge Begbie, died in July. My husband was Tim’s good friend for more than twenty years, and my very close friend Corey Matthews was Tim’s life partner. Grief has been part of the summer season of 2015, and I for one have been a little Victorian in my response to Tim’s death. I have been open and eager to talk with Corey and James about Tim. Our community has celebrated and marked Tim’s passing with rituals. We have held ceremonies and wakes, and we have made tributes. We went to the closing performance of the last play Tim directed, at the Sunset Theatre in Wells. It was his final expression of art, and we understood and celebrated the weight and grief of that hard truth. We have raised glasses to Tim and I have been grateful to the visitors to Barkerville who have been thoughtful enough to ask after us as we negotiate our considerable loss. I have talked with people that I have never met about what Tim has meant to all of us… and it has been a relief to speak his name. It has also been a comfort to hear his name spoken aloud. We have not covered our mirrors or sent black bordered letters, but in our own way we have let ourselves feel and recognize this most significant death. In this way, although we could never have expected it, this Barkerville season has been especially, authentically, Victorian. 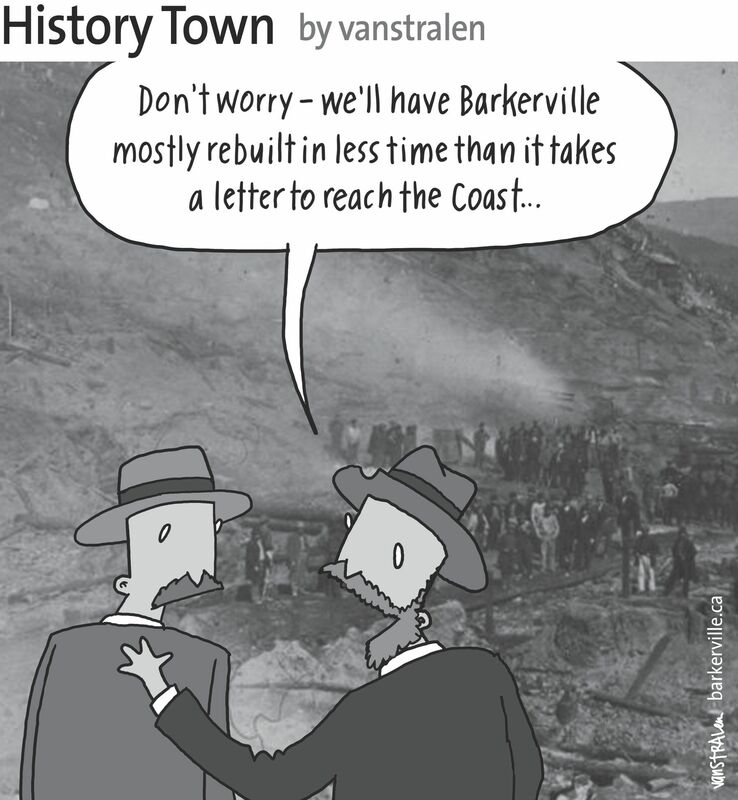 The above one-panel cartoon (originally published September 18, 2015) by Dirk Van Stralen, with accompanying editorial by Danette Boucher, is the fifteenth of twenty weekly entries that were logged – and subsequently blogged – as part of a 2015 collaboration between Barkerville, British Columbia and the Prince George Citizen aimed at introducing the quirkier side of living, working, and playing in the Cariboo Goldfields. We hope you enjoy! Thank you Danette, for this post. It was quite moving.